Three of the top local news stories in Hawaii in 2015 sprang from situations that few observers anticipated would lead to major headlines — building the Thirty Meter Telescope, dodging the bullet in a record hurricane season, and public outcry over hot classrooms. Star-Advertiser. With presidential vacations as bookends, the year in the islands featured David Ige’s shakedown cruise, the still-unfolding TMT-Mauna Kea controversy and new attempts to solve the old problem of homelessness. Civil Beat. 2015: The year in review; Telescope controversy, Kenoi’s pCard abuse, dengue fever among top stories of the year. Tribune-Herald. Top stories of 2015. From barking dogs, bleached coral new stores, and the Aloha Doc, the Garden Island saw its share of news. Garden Island. Coming with the new year is a hike of 75 cents in our state’s minimum wage. Hawaii is one of 14 states where workers will now see more in their paychecks. Hawaii’s hourly wage will be $8.50. Civil Beat. Poor planning and a “lack of effective leadership” within the state Department of Human Services prevented its $155 million computer system from meeting some of the objectives of the federal Affordable Care Act, according to a new report by the Hawaii state auditor. Star-Advertiser. In a report released Wednesday, the state auditor faulted Hawaii’s Department of Human Services in failing to implement the state’s online system for the Affordable Care Act known as Obamacare. Civil Beat. Honolulu, Maui, Kauai and Hawaii counties stand to receive millions more in funding next year from the state's transient accommodations tax if the Legislature approves a working group’s report released this week. Pacific Business News. The U.S. military, with a lot of smokers, is toeing the line on Hawaii’s new ban on cigarettes and tobacco for anyone under 21, which takes effect Friday. Star-Advertiser. The Hawaii State Department of Education has received special recognition by the national U.S. Chamber of Commerce. The U.S. Chamber of Commerce Foundation 2015 Leaders & Laggards report listed the Aloha State for its progress as measured by the National Assessment of Education Progress. Civil Beat. The following fireworks shows will take place throughout the state to usher in the new year. KHON2. Three Laysan albatrosses were killed, several others are missing, and 15 nests were destroyed at the Kaena Point Natural Area Reserve, state conservation enforcement officials said Wednesday. Star-Advertiser. 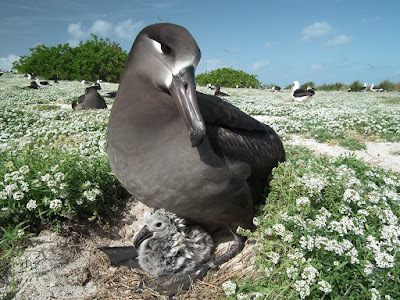 State and federal officials are investigating the deaths of three Laysan albatrosses and the destruction of at least 15 albatross nests at Kaena Point Natural Area Reserve. Hawaii News Now. Next year's November ballot will not include questions about dismantling the rail authority, labeling GMO products or raising the minimum wage. The Honolulu Charter Commission denied all those proposals at a hearing on Wednesday afternoon. Hawaii News Now. El Nino put a damper on Mayor Kirk Caldwell’s road repaving plans, but the crews have continued their work despite the challenges. KITV4. The deaf and visually impaired will have an opportunity to experience Star Wars: The Force Awakens on Saturday at Ward Theatres, marking the first movie showing to provide such accommodations as required under a new Hawaii law. Civil Beat. Hawaiian Telcom and Raycom Media, owner of Hawaii News Now, have agreed to extend their current contract,, eliminating a potential blackout through Jan. 8. Star-Advertiser. Area residents maintain that Lanikai’s popularity has soared since TripAdvisor dubbed its beach the world’s best a few years ago. Also, a coastal science professor known as Dr. Beach, who ranks public beaches in the United States — based on best sand and water quality, environmental management and amenities — and others have spotlighted Lanikai as a top beach. Star-Advertiser. President Barack Obama spent much of Wednesday afternoon, the 12th day of his Hawaiian vacation, with family and friends at a luau hosted by a childhood friend and golf buddy. Star-Advertiser. Eight new confirmed cases of dengue fever were added Wednesday to Hawaii Island’s running tally, which now stands at 190. Meanwhile, the state Department of Health’s Big Island Vector Control offices in Hilo and Kona, which are responsible for controlling the populations of mosquitoes that carry the disease, are preparing to hire one additional worker each, with an online listing for the jobs set to close today. Tribune-Herald. Police were called in Wednesday morning when counter-protesters physically removed signs they find offensive in a Downtown Hilo park that has a playground for small children. Tribune-Herald. A disagreement over a notorious collection of signs at a county park in Hilo led to a temporary upheaval on Wednesday, as opposing viewpoints clashed on the sidewalk beside Lincoln Park. Big Island Video News. November arrivals to Maui increased 2.8% to 193,355 and visitor days increased by 3.8% in November 2015, compared to last year. Maui Now. Maui island is on a record-breaking pace to push beyond a total of 2.5 million visitor arrivals by air this year. Maui News. The number of travelers to Kauai went up by 0.8 percent as compared to this time last year, according to a Tuesday news release from the Hawaii Tourism Authority. Garden Island.